2:45 am: Our last update of the night: Measure 2 in Alaska has 52.3% of the vote with 289 of 441 precincts reporting. 2:15 am: Alaska’s rec measure has slipped a bit as more votes roll in, but it’s still on track to pass. Ballot Measure 2 is currently ahead by a 52.45% to 47.55% margin, with more than half of precincts reporting. Support is a full percentage point lower than about an hour ago. 1:20 am: The U.S. could see a fourth state legalize recreational marijuana sales tonight. Early election results from Alaska have Ballot Measure 2 leading, 53.73% to 46.27%. So far, only 101 out of 441 precincts are reporting, however, so those numbers could change. Alaska has already legalized medical marijuana, but dispensaries are still prohibited, so the state would have to start from scratch when it comes to setting up a regulatory infrastructure for a rec industry. 12:45 am: Oregon has become the third state in the nation to legalize recreational marijuana. Although final votes are still being tabulated, at least two of the state’s leading news outlets have called the race in favor of Measure 91. And New Approach Oregon, the central group backing the measure, declared victory over an hour ago. As the numbers stand now, Measure 91 has captured 54.36% of the vote out of nearly 1 million ballots cast. The win sets the stage for what has been touted as the “new gold standard” for recreational markets, with lower marijuana tax rates than Washington State and an already-established medical cannabis regulatory infrastructure. 12 am: It’s official: Initiative 71 in DC passed by a more than 2-to-1 ratio, with almost 65% of the capital’s voters supporting legal marijuana possession and use. With all 143 precincts reporting, more than 95,000 voters backed the initiative, and just 42,000 cast ballots against it. But the measure still has an uphill fight to remain on the books – Congress could easily overturn the measure, and if so, the vote will essentially be tossed out the window. But if the new law is allowed to stand, the DC city council is already tossing around the possibility of legalizing recreational sales in the nation’s capital, according to multiple reports. If that happens, it could create a $130 million market in the district, with an estimated $20 million in tax revenue, according to The Washington Post. 11:40 pm: Oregon cannabis entrepreneurs, rejoice. Measure 91, which would legalize recreational sales in Oregon, has a solid initial lead, according to early results from the state. Out of roughly 838,000 votes counted so far, 54.56% supported Measure 91, and 45.44% were against it. A crowd at an election night watch party in Portland cheered loudly when the first wave of results were released, according to The Oregonian. If the results hold, Oregon could become the third state in the nation to legalize rec sales, after Colorado and Washington. 11 pm: John Morgan, the attorney who has been the face and voice of the medical marijuana push in Florida, has no plans to go quietly into the night after losing a close battle. The vote by late Tuesday night stood at about 57.5% in support of the measure, but short of the 60% needed for a constitutional amendment in Florida. In a news release, Morgan made his sentiments crystal clear. “We may not have passed Amendment 2 tonight but make no mistake, tonight was a victory in the fight for medical marijuana in Florida,” Morgan said in the release. He went on to say that the fight “does not end tonight” and that advocates will now lobby lawmakers to consider legalizing medical marijuana via the legislature. 10:30 pm: Although voters have apparently spoken in Florida and Washington DC, the night is far from over when it comes to major cannabis ballot measures. In less than an hour, the Oregon Secretary of State’s office is slated to begin releasing results for Measure 91, which would legalize recreational marijuana sales. Less than an hour after that, the Alaska Division of Elections is scheduled to announce initial results in that state’s vote on Ballot Measure 2, also to legalize rec sales. 9:50 pm: It appears that Amendment 2 in Florida is doomed. The measure, which needs 60% of the vote to pass, stood at 57.46% with 87% of precincts reporting as of 9:45 pm. Results are still being tallied in some areas, including heavily populated Broward and Miami-Dade counties, which typically lean heavily Democratic. But it appears the amendment is in too deep of a hole to recover, and some media organizations are officially calling it as a loss for the MMJ crowd. 9 pm: Medical marijuana could be finished in Florida. Support still stands at 57% – below the 60% threshold needed to pass – with more than two-thirds of precincts reporting, according to local TV station News13. 8:30 pm: Marijuana possession and consumption is on the verge of becoming legal in Washington DC. According to early results, Initiative 71 is passing with 64.42% of the vote. DC voters are backing the proposed law by more than a 2-to-1 margin, with only 30.72% voting against the measure. The victory would be a fairly small one – at least immediately – for cannabis businesses. Opportunities would be limited to sales of paraphernalia and cultivation equipment for home growers, since the law doesn’t allow the sale of marijuana. Congress also could seek to overturn the law. Still, the DC city council may consider legalizing recreational sales if 71 passes and gets the nod from Congress. 8:12 pm: An early dose of bad news out of Florida for cannabis entrepreneurs – the first wave of election results released shortly after 8 pm shows Amendment 2 failing, with 56.59% of the vote. It needs 60% to pass. Nearly half of the state’s precincts have reported. 8:10 pm: WTSP in St. Petersburg, Florida, is reporting that Charlie Crist’s bid (see 7 pm entry below) to extend voting hours in strongly Democratic Broward County in south Florida has been denied. Crist made the request after a number of reports of power outages, voting equipment failures and long lines in some strongly Democratic areas. 8 pm: Marijuana legalization in Washington DC may have a key ally in Congress, should Initiative 71 pass today. Kentucky U.S. Sen. Rand Paul, a staunch Republican, told Roll Call that local governments should be allowed to rule themselves. In other words, he’s not inclined to overturn Initiative 71 if DC voters approve it. The key is that Paul heads a Congressional panel that oversees DC laws, which Congress can essentially veto. So Paul’s support may prove vital if 71 passes, as backers will be looking to persuade Congress to let the law stand. 7:30 pm: It could be a bit later than expected before we know whether Florida becomes the next state to legalize medical marijuana. Charlie Crist, who is running as the Democratic candidate for governor of Florida against incumbent Rick Scott, has filed an emergency petition to extend voting by two hours in Broward County. If granted, the move could delay results for all of Florida, including those for Amendment 2. Broward County in south Florida is typically a Democratic stronghold and could be crucial in the vote for MMJ legalization. Polling in the county was scheduled to end at 7 pm – Crist has asked for an extension until 9 pm. To read the emergency petition, click here. 7 pm: About an hour from now, the District of Columbia and Florida are slated to begin releasing election results, including initial vote tallies on their respective marijuana ballot measures. The Florida Department of State even has a digital clock ticking down the seconds on its website until results are posted. Though the first wave of results aren’t definitive, they’re often an indicator of how the vote may swing. And for that reason they are always highly anticipated by pollwatchers. Marijuana Business Daily will be posting results as soon as they become available for Florida and Washington DC, as well as Oregon and Alaska. Results from the latter two won’t be available for another several hours. 6:45 pm: The potential market for medical marijuana in Florida is gigantic. 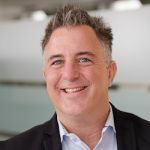 Tom Quigley – chief executive officer of Common Bond Collaborative, a new cannabis business incubator in Tampa – estimated Tuesday evening that at least 436,000 residents would be eligible to use medical marijuana for their ailments. Maybe even more. “We’re estimating $785 million in revenues for the state of Florida in its first full year of operations if Amendment 2 passes, and we think those estimates are conservative,” he said. Of course, it will all depend on the final list of qualifying medical conditions and the regulatory structure the state sets up on MMJ businesses. The market could be much smaller. And of course the measure needs to actually pass. But you can see why entrepreneurs around the country are salivating – and planning to track the election closely tonight. 6:15 pm: Hold your breath, cross your fingers and pray. That’s the plan for Election Day watchers at the Washington DC-based Marijuana Policy Project, said Bob Capecchi, deputy director of state policies for the group. Capecchi said his organization is expecting that Washington DC’s Initiative 71 will pass, but the other three biggies – Alaska, Florida and Oregon – are going to be nail-biters. Capecchi pointed out that polling in Alaska, Florida and Oregon has been “all over the place” though, so it’s hard for proponents to feel overly confident in those measures. Still, he said polls for the recreational proposals in Washington and Colorado two years ago “were coming in lower than what they ultimately ended up at,” so there’s hope. Several MPP staffers are likely going to be monitoring results from across the country at a local DC bar called Meridian Pint, where the Initiative 71 campaign and a local MMJ dispensary are hosting a watch party. 5 pm: Maurizio Jose Passariello, communications manager at United for Care, said late Tuesday that the fledgling cannabis business community in Florida has been crucial to generating support for Amendment 2, both in terms of donations and helping with volunteer efforts. If the measure passes, Passariello said, an organization called Florida for Care will work with willing lawmakers to start enacting legislation in the state. The group will also work with the Florida Department of Health and individual communities to address issues and concerns, and hopefully start building an infrastructure. 4 pm: If at first you don’t succeed, try, try again…in two years. John Morgan – the Florida attorney who has spent over $5 million of his own money backing Amendment 2 – told the Tampa Bay Times that if the measure fails in a tight vote, he’ll come back for round two in 2016. Amendment 2, which has polled from the low 50s to the high 80s, needs 60% to pass. 3:15 pm: Buckle up – it could be an exciting ride tonight in Florida. United for Care, the main group behind Amendment 2, is expecting the vote to go down to the wire. “We are hearing it’s going to be extremely, extremely tight,” the group said in a press release sent out this afternoon. 2:40 pm: The first election results are in: Guam voters have legalized medical marijuana for patients with debilitating conditions. About 56% of voters approved the measure, making Guam the first U.S. territory to legalize medical cannabis. A government commission will establish rules and regulations in coming months, including those tied to the production and sale of medical marijuana. Once those are established, we’ll have a much better idea of the business implications, the potential market size and the level of opportunities (if any) for MMJ companies in other markets to get involved. The vote marks an early election victory for pro-marijuana advocates. “That’s great news, and a positive omen, for marijuana reform efforts across the country,” particularly because Guam is usually more conservative and is also home to a large number of U.S. military members, Ethan Nadelmann, executive director of the Drug Policy Alliance, said in a press release. A spokesman for the opposition said it isn’t a surprise that the measure passed, adding that Guam’s laws are more restrictive than most in U.S. states. Guam’s initiative, for example, doesn’t allow patients to grow marijuana plants, which many state measures allow, the Washington Post reported. Still, Guam’s measure doesn’t specify which conditions qualify as debilitating, unlike many mainland initiatives. 2:15 pm: The Vote Yes on 91 campaign in Oregon has yet to update its website today. In fact, the site’s last update was Friday. Then again, the Vote No on 91 campaign hasn’t updated its blog since the weekend. One would imagine that both campaigns are deploying all their resources out in the field for a last-minute push to sway voters. 1:30 pm: United for Care – the main group behind Florida’s medical marijuana legalization measure – will host its official watch party at Fresco’s Waterfront Bistro in St. Petersburg. 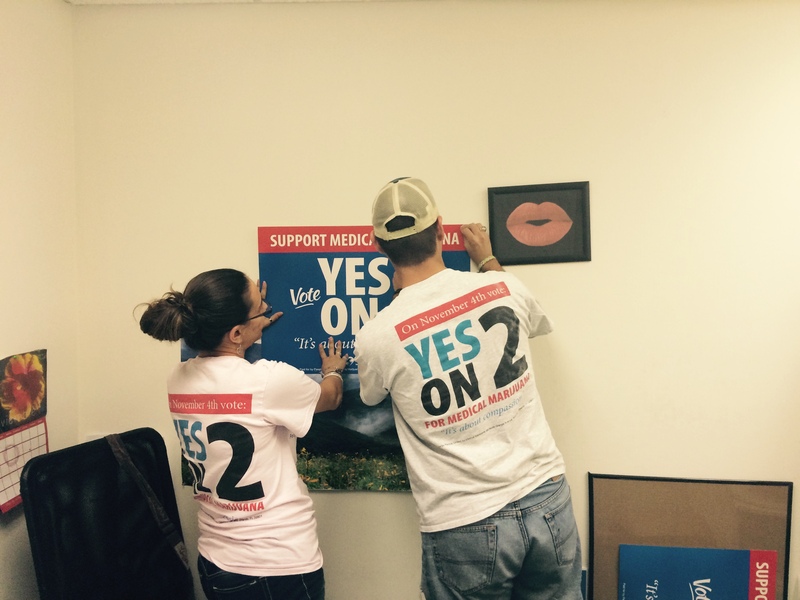 Workers, volunteers and patients will gather starting at 7 pm to watch the results on Amendment 2 roll in. 1 pm: Thieves have stolen digital voter books from a polling place in Washington DC, according to Denise Tolliver, a spokeswoman for the city’s election board. Tolliver told the Associated Press that four electronic books were replaced before polling began at 7 am. The thieves won’t be able to access the data without being connected to an elections board network. 12:30 pm: The city council of North Plains, Oregon, voted on Monday night to place a 10% tax on recreational marijuana and infused products should voters pass Measure 91. The council, however, said it wouldn’t tax medical marijuana. Measure 91 could come down to the wire tonight. In a recent poll by Oregon Public Broadcasting, 52% of 516 voters surveyed said they support the legalization measure while 41% said they oppose it. 11:45 am: Marijuana legalization advocates in Washington DC are telling people to avoid lighting up – especially in front of the White House – if Initiative 71 passes. “We’re not going to do it on the street, I will be upset if I see people smoking weed on the streets,” Adam Eidinger, a key figure behind the legalization proposal, told the Washington Post. The measure had a 2-to-1 lead in a recent poll, so the chances are high that it will pass. But it would still face a congressional review, according to the Post. And celebrating a legislative victory by blowing smoke in the faces of residents and opponents is probably not wise.